This budget priced service is ideal for finding your interests, values and natural talents then matches them against 60,000 career options. You save the cost of a professional counselor. The key feature is our IDAK Career Match which evaluates your interests, values and natural talents and matches them to 60,000 career options, selecting the ten which fit you best. Two audio CDs substitute for a counselor’s individual guidance. All best matches are numerically coded so as to link up with websites which list employers in your local area. Your ideal career possibilities revealed. 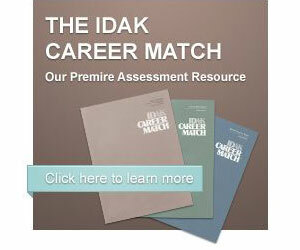 The IDAK Career Match is a computer scored assessment tool which evaluates your career interests and values along with your natural talents. The assessment results then are matched to over 60,000 career options including ministry service, business, industry, government agencies, military departments, education and nonprofit organizations. It even includes an Employer Search Guide to help connect you with career and employment opportunities in cities of your choice.